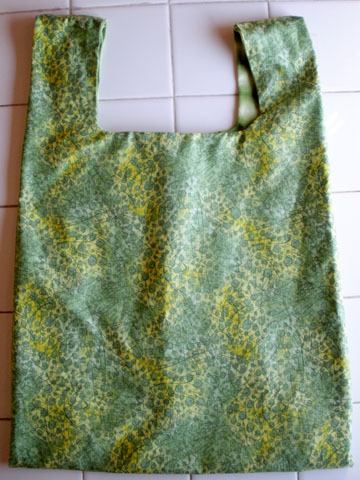 This is a cross between bags 1 and 3 with no french seams and the opening left in the top edge rather than the handles or sides. It hits the two important markers of being easy to make and has a neat appearance. The only thing keeping it from perfection is still a bit of bulk in the handle tops. 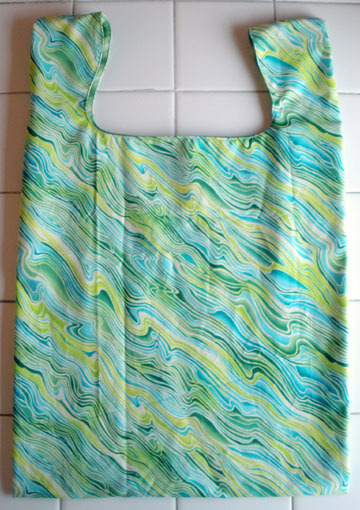 I’m told that a pattern for a lined vest holds the answer but I haven’t found one yet. On the plus side, I actually remembered to bring them to the grocery store yesterday. Yay me! All borders are on. Backing, check. I’ve ordered the batting. Hopefully by the time the real cold gets here, it will be done. 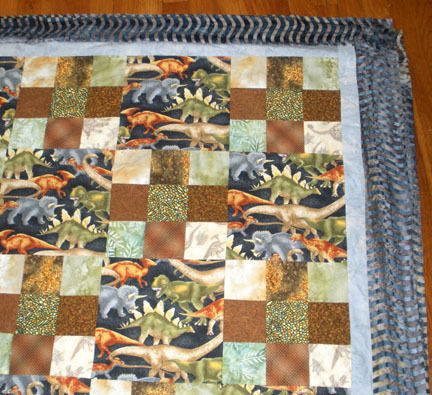 I’m going to quilt this one myself. 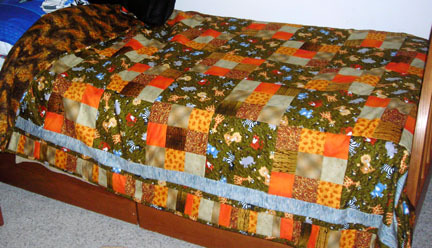 I haven’t done that on a large one since the twin quilt for the big boy. It was a simple stitch in the ditch. I think I’ll practice a bit first to see if I’m up for trying anything more elaborate than that. Dinosaurs tracks maybe?… grrr. My husband and I watch Project Runway together (willingly, I might add). We were watching the last episode where Joe made a call to his wife and kids. I miss you, I miss you, etc. I asked my husband what it would take for him to leave me and the kids for three months. I roared laughing. God I love that man. 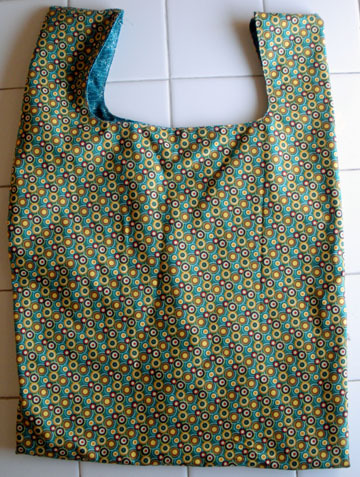 I wanted to sew some grocery-style bags. Re-usable, environmentally friendly and lovely to boot. I have some old string bags from my California years but they’re completely forgettable. Meaning I forget them at home every time I go to the grocery store. I wanted something nicer. My friend Becca made some beautiful ones from a pattern she found online. So I searched online. 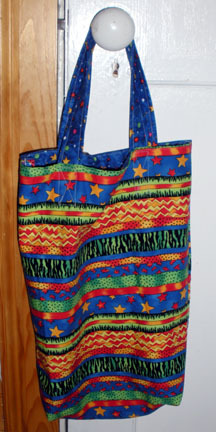 I found this pattern and made my first bag. It was pretty quick and easy. I was fairly loosey-goosey with the plastic bag template and there is quite a bit of unevenness in the sides and handles. Still, I liked the sturdiness of it and the fact that there is no seam at the bottom. That seems like a good idea considering the weight it could possibly hold. My only objection to it was a bit of bulk in the tops of the handles. So I tried a few adjustments to my first pattern. The fabric I had (and love, isn’t it gorgeous even though it clearly needs ironing?) was 2″ narrower than my template but I decided to go with it anyway. I added topstitching and french seams to make it more polished. It got quite a bit smaller and I hadn’t adjusted the handles enough so the openings are a bit tight. I decided the topstitching was definitely a good idea but the french seam inside was overkill. Onto bag #3. I tightened up the template, making a paper one that was even on the handles. 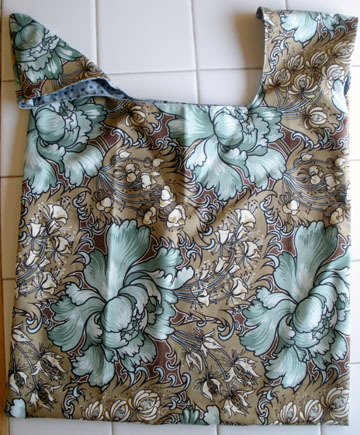 I sewed it following the original pattern only I left the handle tops open instead of the side and turned the bag inside out that way. Then I topstitched around the handles. With the four handle ends open, I did a french seam there only. A tiny bit less bulky but not that noticiable. Overall the improvements from the new template and topstitching are good. I’m still hoping for a little less bulk in the handle top. And of course, all these variations are still very usable and oh, so pretty. I can’t find the big boy’s Diego backpack for him to take to school. I ran out of ideas on where to look and needed a solution. I whipped this up last night. Luckily for me he’s still in that lovely stage where he’s not mortified to carry a home-made bag to school. He was actually rather excited about it, bless his pointed little head. In the first year of my attempts to can anything, I consulted “The Joy of Cooking.” If you have read the first paragraph of the canning section, it recalls the feeling one gets from surveying the rows of jars of your homemade bounty as akin to a “clear conscience or a very becoming hat.” (And not ever being the owner of a ‘very becoming hat’ due in large part to my very large head, I can only imagine how good it feels.) 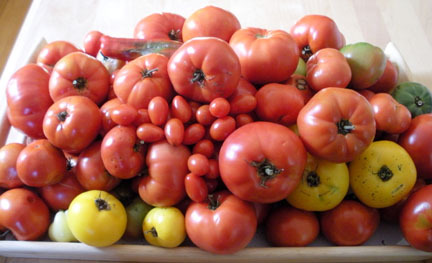 I’m torn between the desire to share the deliciousness from my garden and hoarding it all myself. I mean, after all, it’s a lot of work for those 10 jars of salsa. 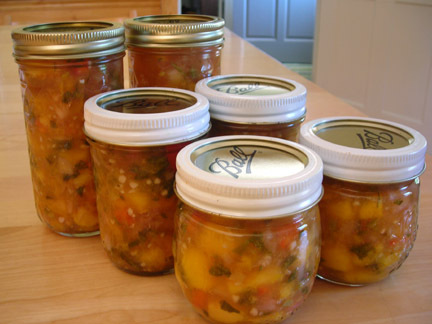 In any case, we’ve got peach salsa from the peach trees and the first of the red salsa from the tomato plants. I’m mighty proud. I may even buy myself a hat.